According to the American Lung Association, more cancer-related deaths are attributed to lung cancer in the United States each year than breast, colon or prostate cancer, while about 13 million people are affected by chronic obstructive pulmonary disease, or COPD. What’s even more tragic is that these diseases are largely preventable. The good news is that quitting smoking now may reduce your risk. Certain supplements, such as licorice root, can complement a smoking cessation program. However, ask your doctor if you can safely use licorice root first, since there are several contraindications and drug interactions possible with this herb. Licorice is the root of Glycyrrhiza glabra, a type of legume native to Europe and Asia. The flavor of licorice root is due to the presence of an aromatic compound called anethole, which is also found in fennel and anise. However, even though the latter impart a similar taste and aroma as licorice, they are not botanically related. Another compound in licorice root, glycyrrhizin, provides sweetness up to 50 times greater than sugar, which explains why the herb is also known as sweet root. Licorice root has been used in herbal medicine for centuries to treat a variety of conditions. According to the University of Maryland Medical Center, licorice root is traditionally used as an expectorant and demulcent, which means to expel mucous and soothe irritation, respectively. As such, it is commonly used to treat cough associated with upper respiratory disorders, such as asthma and bronchitis. 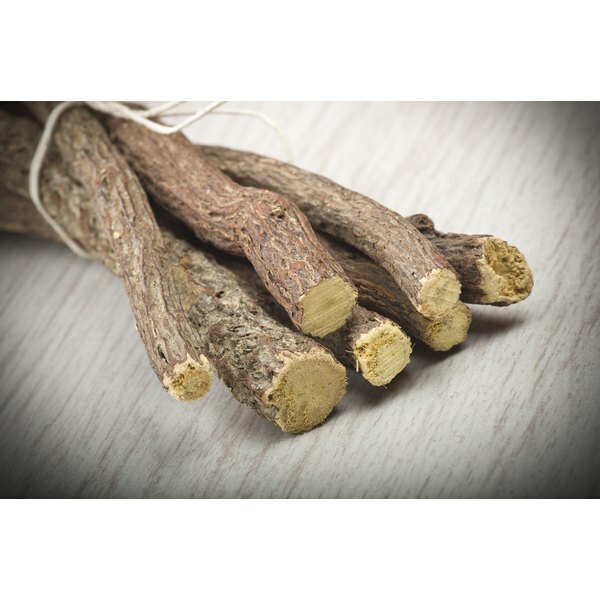 Other applications for licorice root include gastrointestinal complaints, such as acid reflux and peptic ulcers. However, these conditions are treated with a modified extract of the herb called deglycyrrhizinated licorice, or DGL, in which he glycyrrhizin content has been removed. While there is no clinical evidence to support the use of licorice root to stop smoking, anecdotal evidence does exist. However, there are different schools of thought on how licorice helps. The most common theory held by modern herbalists is that licorice root enhances adrenal function because glycyrrhizin has a chemical structure similar to that of corticosteroid hormones produced by the adrenal glands. Smoking puts stress on the adrenal glands to release harmful substances, such as adrenaline, which can have adverse effects on the heart, blood vessels and blood sugar levels. Licorice root is sold as a dietary supplement. Preparations are available in capsule form and as a tincture and liquid extract standardized to contain 20 percent glycyrrhizinic acid. DGL is available as a liquid extract and chewable tablet. Licorice root should not be taken longer than six weeks. High doses or long-term use of glycyrrhizinic acid may cause potassium depletion, high blood pressure, edema and pseudoaldosteronism, a condition characterized by sensitivity to adrenal hormones. Do not use licorice root if you are pregnant, nursing, or have a history of diabetes, hypertension or heart, liver or kidney disease. Licorice root may increase the effects of heart and diabetes medications, ACE inhibitors, diuretics and corticosteroids. Consult your health care practitioner before using this herb if you have a chronic condition or are taking other medications.